What do you do when your furry friend becomes too bushy, dirty or has overgrown nails? I don’t know about you but I will say grooming from a pet grooming stylist shouldn’t be long in coming. Safari Veterinary Care Centers offers one of the best dog grooming in League City. This fact is a little wonder when you consider the fact that we have one of the best veterinary personnel in the whole of Texas. 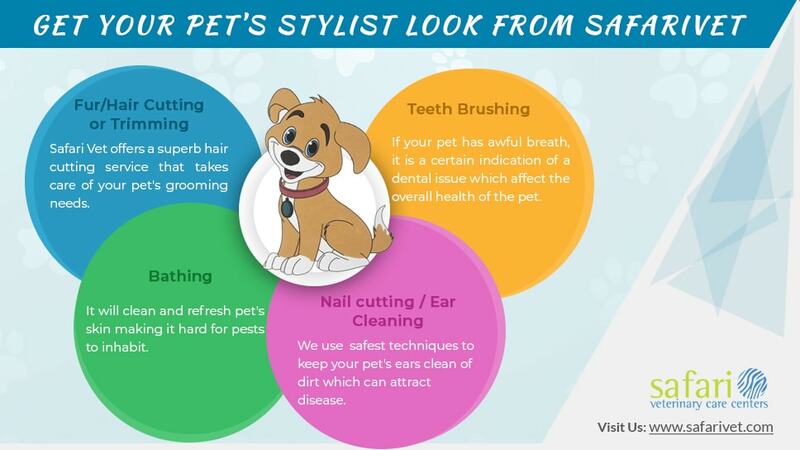 With our wide experience in handling different types of pets irrespective of the breed and individual character, you can be certain that your pet will have a stylish look after we groom it. We have a sizable array of grooming equipment and accessories guaranteed to leave your pet looking posh and pampered. Our grooming stylists use only recommended products to ensure that your pet is in no danger at any time. We use natural and quality shampoos to clean out your pet’s fur up close to the skin. All conditioners and teeth cleaners used are tried and tested to be safe to use on your pet. You can count on us giving your pet a clean and trim hair and fur cut to improve its look. Some breeds are quite hairy/furry and not as easy to manage as others. Matted hair, overgrown fur, and pest infested fur are all unwanted consequences of a poor grooming hygiene. Since your pet obviously can’t cut its hair by itself, the work has to be done by either you (if you know how to) or by a professional hair cutting stylist – this is where we come in! Animal Care Center offers a superb hair cutting service that takes care of your pet’s grooming needs. We can handle this service for any size or breed of dog. You can choose from the different hair grooming styles we have in our portfolio to give your dog that classy, refined dog look. An aspect of grooming that must not be excluded is pet bathing. Pets need to be in the cleanest possible state at all times. To bath your pet, you will need a hair shampoo and conditioner that is known to be effective against such breeds. Regular bathing is encouraged at least once weekly especially if your pet is an active one that is always outdoors. Bathing will not only keep your pet clean but when done with treated water, it will clean and refresh its skin making it hard for pests to inhabit. We are not the only ones who get to enjoy the benefits of teeth brushing. Your dog can also have a white flashing smile. Brushing your pet’s teeth is a grooming technique you best initiate it into at an early age. This is because any unusual practice introduced to your pet when already an adult pet will not be easy to enforce. The best time to introduce teeth brushing to your pet is during the early years. Puppies and kittens are easier to manipulate than full-grown adult pets. The best way to go about this is by contacting your veterinarian for assistance if you can’t do it yourself. A poor dental hygiene in your pet can lead to a bad dental condition which may lead to periodontal disease. When left untreated for a long time, this condition can lead to other life-threatening disease conditions. The way out is by acting quickly and reaching out to a specialist veterinary expert for dental assistants and possibly surgery. Should your pet require this procedure for any reason, your best bet will be to contact an emergency pet hospital in League City for help. Our grooming service also includes trimming your pet’s nails and cleaning its ears. An all-around clean pet is a joy to be with and you will be glad when we groom your pet for you. We use the safest techniques to keep your pet’s ears clean of wax and dirt which can attract disease-causing germs. When SafariVet pet grooming stylists work on your pet, one thing is sure – your pet will not only look dashing but feel dandy as well! Get across to us right away so we can work our magic on your dear pet in no time!